In Australia, the traditional roast to have is roast leg of lamb. It is one of our favourites . Sometimes you would like to have a roast but only have 2 of you at home and not sure what to do with the leftovers. You can either have it on sandwiches for the next couple of days or make a shepherd's pie or a curry, that you can then put in the freezer for a later date. Shepherd's pie an oldie but a goodie. I'm sure most families would have a recipe that has been passed down over the years. Peel 6 potatoes and boil until soft. Mash. Cut off as much meat off the bone, mince a whole peeled onion, 1 stick of celery and a carrot in a food processor. Add the meat and mince roughly so there is still texture. Pour into a bowl and add 1-2 tspns of Brown sauce,1-2 tspns of Worcestershire sauce,and lots of pepper. Mix well. Place in a baking tray,spread evenly. 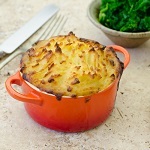 Then top with the mashed potato. Cover and freeze until required. When you cook it, spray the top with olive oil spray and dobs of butter for richness. Cook for 30mins in 180 celcius oven ,until golden brown on top. Cut as much of the lamb off the bone and dice. Fry one diced onion, 1 tspns ginger, 2 cloves of garlic, 1 tspn of each of the following: turmeric,cumin and garam masala. Add 2 tspns of ground coriander and as much chilli as you like. With younger children, I omit the chilli and just have it cut up, to add at the table. Add your lamb,coconut milk and 1/2 can chopped tomatoes. Simmer until flavours have combined. Serve with steamed rice, papadums ,kasoundi,fresh coriander and chilli to your liking. This can be placed in the freezer for a later date too. Enjoy the end of Spring! Both of these dishes would go well with Andrew Peace Gold Reserve Cabernet Shiraz.